A hardware security module is a dedicated crypto processor, designed to protect the crypto key lifecycle, validated for security by third parties (FIPS 140-2, Common Criteria, PCI HSM, FIPS 201). A hardware security module is a trust anchor. A trust anchor that protects the things we use every day. Things like SSL, DNS, banking and websites. Mobile devices. Smart meters. Medical devices. National identity cards. Credit card data and PINs. Mobile payments and verbal banking. Digital documents. Passports. And so much more. Hardware security modules typically are appliances or cards. Appliances or cards that ensure compliance. Simplify audits. Improve performance. Securely generate and store keys. Hardware security modules are trusted by the most security-conscious companies, agencies, banks, and service providers in the world. 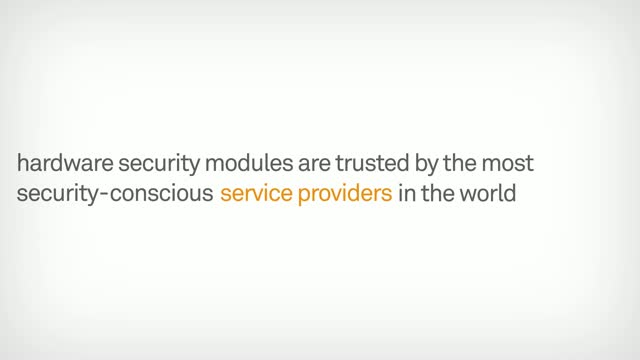 Hardware security modules: trust anchors in a digital world. Title: HSM 101: What is a Hardware Security Module?